Jesus says, "He that is without sin among you, let him cast the first stone at her." ARLY THE NEXT morning after the officers had failed to take Jesus, the scribes and Pharisees had planned another way to capture him. They would go themselves, and ask him a great question concerning the teaching of the law of Moses. Already they thought they knew how he would answer, and then they would have opportunity to find fault with him. Jesus was in the temple when his enemies came, bringing with them a very wicked woman whom the law of Moses commanded should be punished by death. They went straight to Jesus and said, "Master this woman is very wicked, and Moses in the law has commanded that such a person should be stoned until she dies. But what do you say we shall do to her?" Jesus knew they were tempting him, and at first he paid no attention to them. He stooped down and with his finger wrote on the dust of the ground. But those enemies would not be gotten rid of so easily. Now they believed they had caught him in a trap, and they kept asking until finally he raised up, and looked at them and said, "Let the man among you who is without sin cast the first stone at her." So saying, he stooped down again and continued to write with his finger in the dust. The men were much surprised at his reply to their question. They looked at each other, then at the woman who stood trembling in their midst, and their own consciences reminded them of their sins. They were afraid to pick up stones, for fear God might cause them to fall dead because they, too, were sinners. The older men shook their heads and turned to go away. The younger men, too, felt the accusations of their own guilty consciences, and they followed the older men out of the temple. When all the men had gone out, Jesus looked up from the ground and saw only the woman standing before him. He asked, "Woman, where are those men who accused you of this great sin? Did no one condemn you?" She replied, "No man, Lord." Then he said,, "Neither do I condemn you; go, and do not commit sin any more." So she, too, turned and went away. Many people were now gathering in the temple, and Jesus began to teach them again. He began by saying, "I am the light of the world: the man who follows me shall not walk in the darkness, but shall have the light of life." And the Pharisees who heard him began to accuse him, saying, "Your words are not true, because you speak of your own self." But Jesus answered that even though he did speak of himself, he knew that his words were true, for he knew who had sent him into the world and where he would go when he should leave the world. He said, "You can not tell these things." Then he told them that another besides himself spoke of him in the same way, and that one was his Father. So they asked, "Where is your Father?" Jesus answered, "If you knew me, you would know my Father; but you know neither me nor my Father?" All that day Jesus taught in the temple, speaking very plainly to the Jews and telling them about their sins. And the displeasure of his enemies increased more and more, until finally they thought they would listen no longer. For Jesus had said that if any one would obey his words that one should never see death. Jesus meant that that one should never die in sin and be lost. But his enemies did not understand, and they said, "Now we know you have an evil spirit, for Abraham is dead, and all the prophets are dead; and you say that any man who keeps your words will never die. Are you greater than our father Abraham, who is dead? and the prophets, too, are dead: who do you claim to be?" Jesus replied, "I do not honor myself; but my Father, whom you call your God, he it is who honors me. You have not known my Father; but I know him. If I should say I know him not, I should be speaking a lie. I know him, and I obey his words. Your father Abraham was glad when he saw my day, but you do not behave like the children of Abraham." "I AM" was the name by which God was known, and the Jews were struck with horror when they heard Jesus call himself by that sacred name. 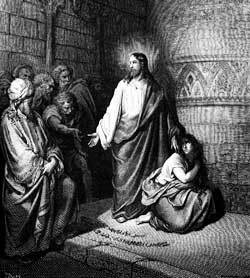 They picked up stones to hurl at him, but Jesus hid himself among the people, then quietly passed out of the temple and walked away.